The DubReq Stylophone is an icon of English innovation originally made in the UK during 1968 and famously promoted by Rolf Harris until manufacturing was stopped in 1975. The ‘original’ Stylophone has (since 1975) been remade several times, firstly the ‘new sound’ Stylophone which was based around a 555 timer oscillator and more recently as a ‘retro toy’ containing custom electronics. This reverse engineering article focuses on the original (and in many people’s opinion (including mine) – the best) Stylophone which was based around a programmable uni-junction transistor ‘relaxation oscillator’ which gave the Stylophone its unique sound. During the 1970s the 555 timer was introduced and has since completely replaced relaxation oscillators with simpler and cheaper 555 timer based square-wave tone generators. 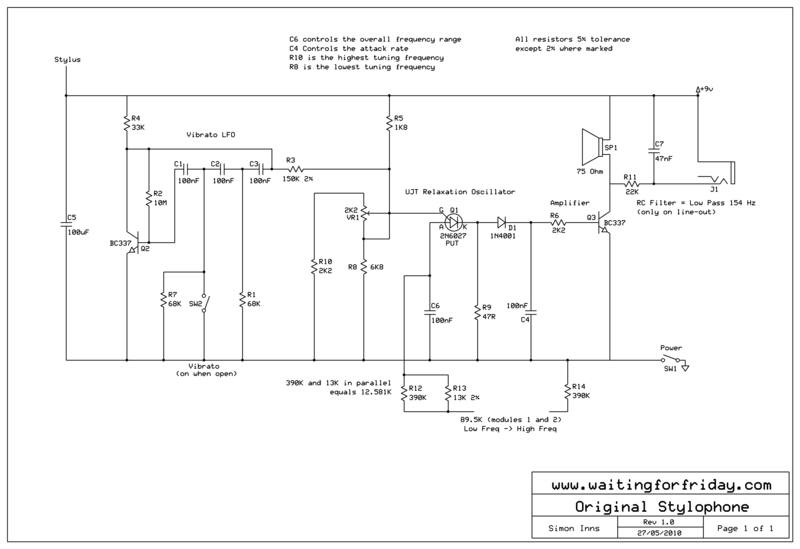 There are a number of circuit diagrams of the Stylophone available on the web, however none of these diagrams seemed to match the Stylophone version I had. 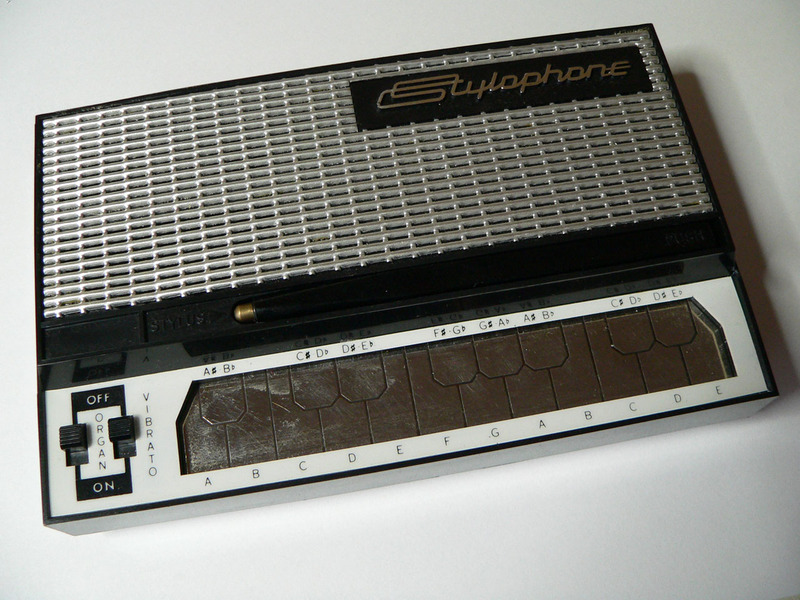 Researching on the web revealed that there were at least 3 versions of the original Stylophone. The first had individual resistors controlling the pitch output, then there were two further versions which used ‘resistor modules’ one with white modules and a later one with orange modules. The version I have is the white module version. I’ve added some notes to the diagram explaining the functions of the various parts. Since there were no markings on the original transistors or PUT (Programmable Uni-junction Transistor) I replaced them with modern equivalents. For the PUT the choice of replacement was quite limited since there are not that many modern PUTs produced. To test the schematic I built it on a breadboard and compared the output to the original (using an oscilloscope) and the result was surprisingly close to the original. You can quite easily use the circuit diagram above to build your own Stylophone (I did and it worked well). The frequency of the vibrato signal is approximately 7Hz. As the vibrato generator takes a little time to ‘charge’ there is a delay of 0.5 seconds between switching on the vibrato and the altered signal being seen at the relaxation oscillator output. As can be seen from the table there is a greater variance as the frequency increases and the negative and positive variance is fairly even across the frequency range. An interesting feature of the circuit is the line-out for connecting the Stylophone to an external amplifier. There is a passive 154Hz low-pass filter on the line-out which is not used by the internal speaker. This means that the line-out sounds noticeably different from the speaker output (which explains why music artists which used the Stylophone held it up to a mic and played it rather than just amping the device directly). To understand the relaxation oscillator and its characteristics we must look at the parts of the oscillator in more detail. The PUT (Programmable Uni-junction Transistor) is ‘programmed’ by the voltage present on the gate (G). The gate voltage is supplied by a classic resistor voltage divider; however the voltage divider also contains a potentiometer which allows the programming to be changed (in this case the programming defines the overall tuning of the Stylophone). If we consider Ohm’s law for the voltage divider we see that Vout = (Z2 / (Z1 + Z2)) x Vin where Z1 is the positive-side resistance and Z2 is the negative-side. 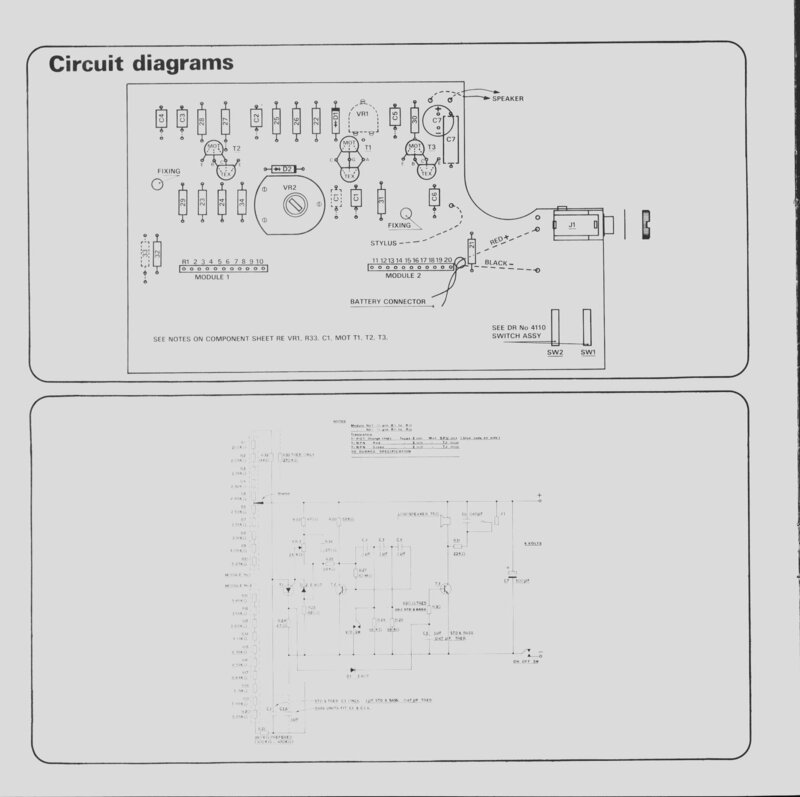 Looking at the original Stylophone diagram we can see that Z1 is 1800 ohms. Z2 consists of 2 resistors and a potentiometer (R8, R10 and VR1). In this configuration the Z2 resistance can be varied between 1662.22 and 2671.43 ohms (note: Z2 = 1/(1/(R10 + VR1)+1/R8) where VR1 is 0-2200 ohms). The PUT only allows power to flow between the Anode and Cathode if the Anode voltage exceeds the gate voltage (actually, for the 2N6027, the A has to exceed G by 0.35V) and the charging and discharging of the capacitor on the Anode is what causes the oscillation to take place. To calculate the given frequency of the relaxation oscillator we must first calculate η (eta) which is the intrinsic stand-off ratio of the PUT. Eta is given by the formula: η = Z2 / (Z1 + Z2). Since Z2 is variable this gives a possible range of 0.48 to 0.60. So if we choose our lowest and highest value for η of 0.48 to 0.60 and we take the value of C from the circuit diagram (100nF) we can calculate the frequency range of the Stylophone from the resistor values across the keypad. From the circuit diagram we can see that the minimum possible value for R is 33.581K and the maximum is 102.081K. The ‘standard’ Stylophone tuning supports A2 to E4 or 110Hz to 329.628Hz and the calculation shows a possible range of 107Hz to 455Hz (of course, in the real circuit there are tolerances and other issues which may effect this). Sources on the web show that the Stylophone was also designed to support two other tunings for a bass Stylophone and a treble Stylophone. 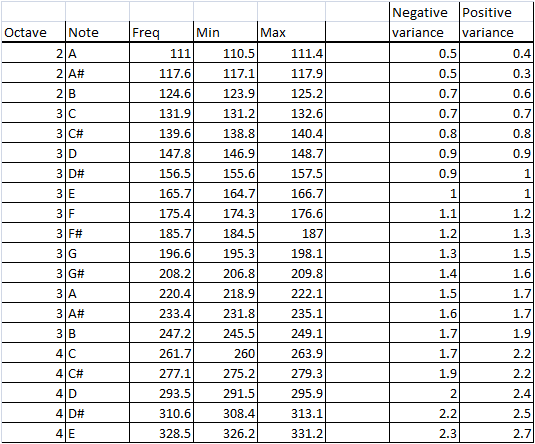 The ‘bass’ tuning supports A1 to E3 or 55Hz to 164.814Hz. 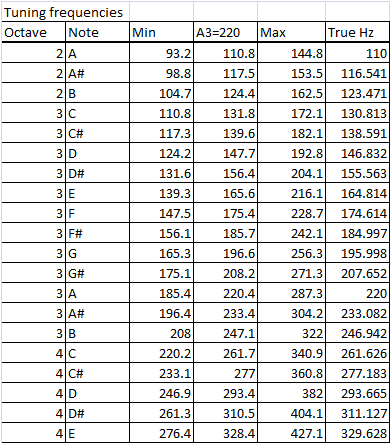 The ‘treble’ tuning supports A3 to E5 or 220Hz to 659.255Hz. 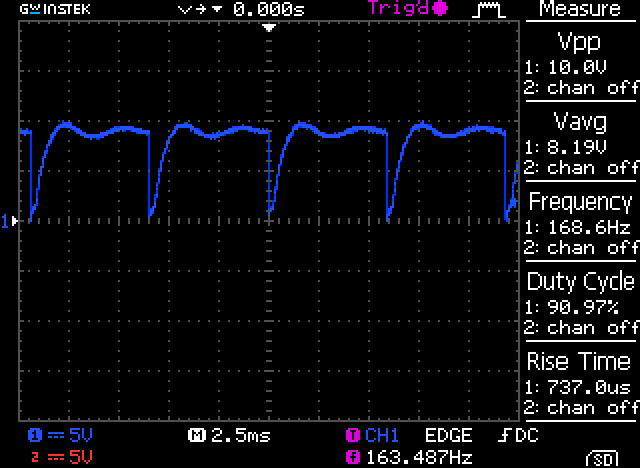 The combination of the diode (D1) and the capacitor (C4) control the ‘attack’ rate of the sound output. When a note is first ‘pressed’ the capacitor (C4) starts charging. This causes the volume level to gradually increase rather than just going from nothing to full volume. In the ‘treble’ version of the Stylophone C4 is 47nF rather than 100nF which causes a faster attack rate. The vibrato is supplied by a classic RC Oscillator circuit (also known as a phase-shift oscillator). It consists of 3 RC networks each providing 60 degrees of phase-shift resulting in a total shift of 180 degrees. The RC Oscillator is simple to simulate and should provide around 8.5Hz with a 4.2V P-P sine wave (Peak-to-Peak) under ideal conditions (the actual frequency is also affected by the setting of VR1). The connection of the RC Oscillator to the PUT’s gate will also vary the oscillators output slightly. The vibrato effect is provided by the RC Oscillator offsetting the PUT’s η (eta) value. The 4.2V P-P means the variation in frequency should be fairly even above and below the intended frequency of the relaxation oscillation. When SW2 is closed the RC Oscillation circuit outputs a constant voltage which is approximately half of the P-P voltage when oscillating.